Hello lovely blog readers! I am back in the US! I’ve actually been back about 3 weeks, but hadn’t done a lot of cooking new things until now. It’s pretty delightful having a kitchen that has all the right bits and pieces, but you won’t need anything too special for this recipe. It can be a bit of a struggle for me to make vegetable-heavy meals that I’ll actually like, but adding cheese and sausage does a pretty good job of overcoming that. This is real tasty, and at least healthier than layering the cheese and sausage in a heap of pasta. 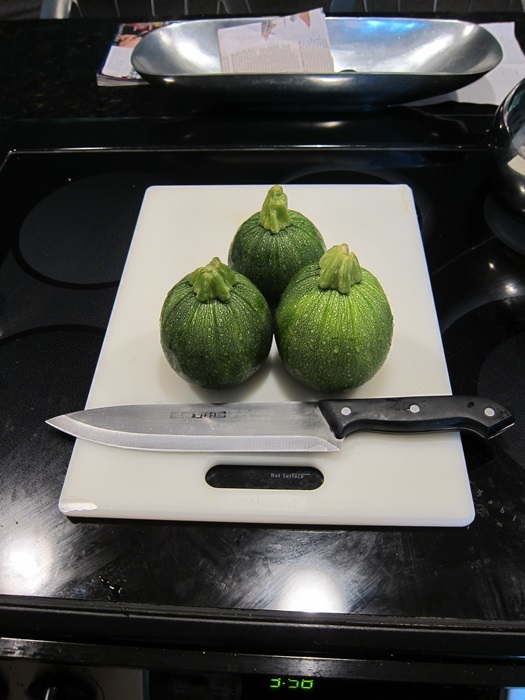 The internet tells me these are called Eight Ball Zucchini, which I’ll go along with. 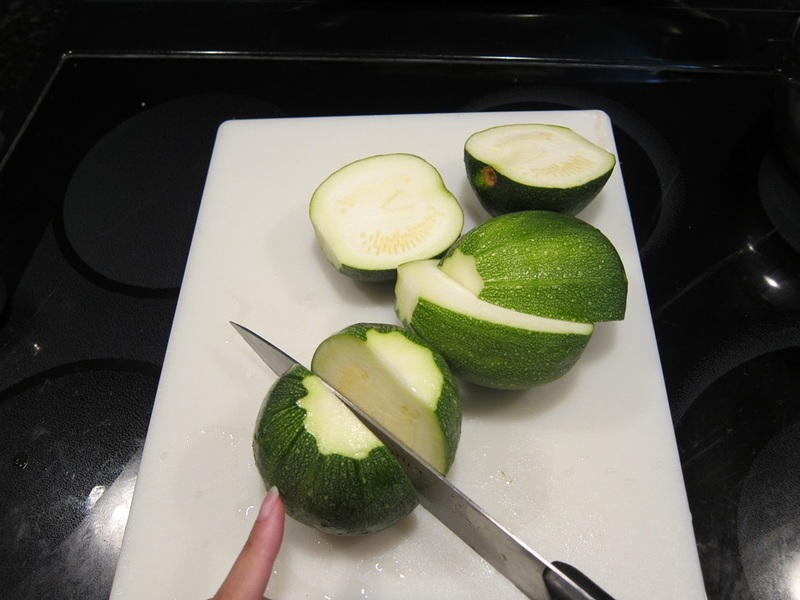 Start by cutting the stems off of the zucchini, then cutting the zucchini in half, top to bottom. 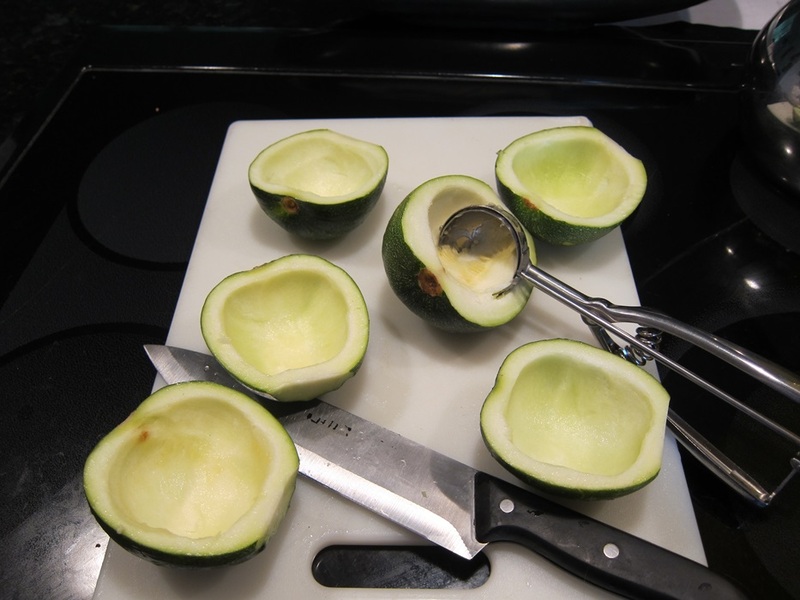 Scoop out the inside of the zucchini, using a melon baller, ice cream scoop, or grapefruit spoon. Leave about a 1/4″ “shell” intact. 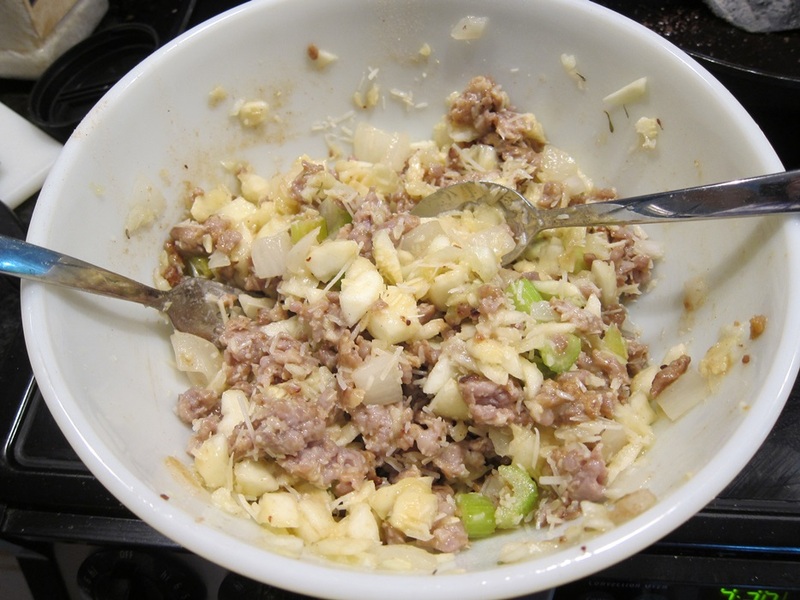 Chop up the insides that you’ve scooped out, then set aside in a large bowl. Microwave the outsides for 3 minutes, and set those aside as well. 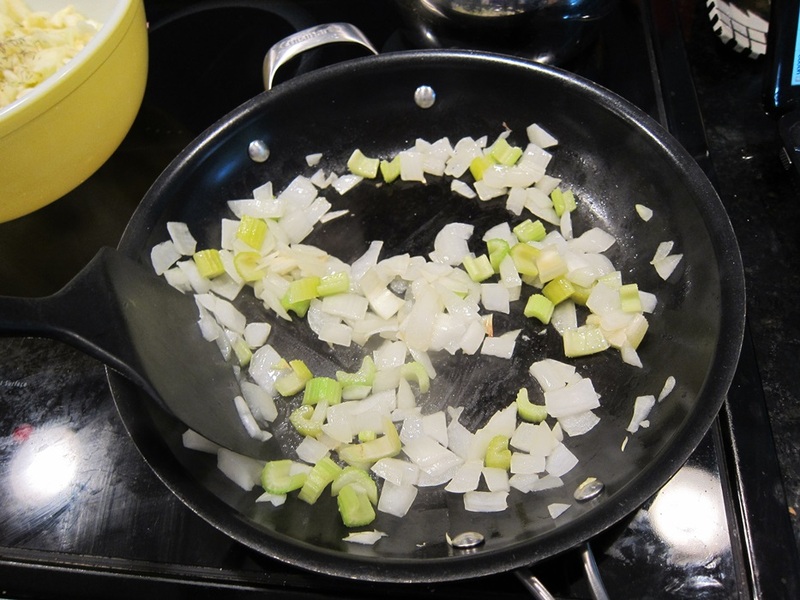 Over medium heat, cook the onion and celery with a glug of olive oil until softened. Pour the onion and celery off into the same bowl as the chopped zucchini. Cook the sausage in the now-empty pan until lightly browned, then add that to the bowl. Briefly beat the egg, then add to the bowl. Add the bread crumbs, thyme, and cheese and stir everything together. Lightly grease a baking dish just large enough to hold all the zucchini shells open-side up, such as an 8X8″ pan. Fill the shells with a heaping amount of the sausage mixture. Place any remaining mixture in a small greased pan, like a bread pan. Sprinkle additional cheese on top of the zucchinis, as desired. Bake 20 minutes, or until lightly browned on top. Serve, enjoy, and feel a bit healthy for having eaten veg! Inspired by AllRecipes, with some help from Kalyn’s Kitchen. Start by cutting the stems off of the zucchini, then cutting the zucchini in half, top to bottom. Scoop out the inside of the zucchini, using a melon baller, ice cream scoop, or grapefruit spoon, and leaving a 1/4″ “shell” intact. Chop up the insides that you’ve scooped out, then set aside in a large bowl. Microwave the outsides for 3 minutes, and set those aside as well. Over medium heat, cook the onion and celery with a glug of olive oil until softened, then transfer to the bowl with the zucchini. Cook the sausage until lightly browned, then add to the same bowl. Briefly beat the egg, then add to the bowl. Add the bread crumbs, thyme, and cheese and stir everything together. Lightly grease a baking dish just large enough to hold all the zucchini shells open-side up, such as an 8X8″ pan. 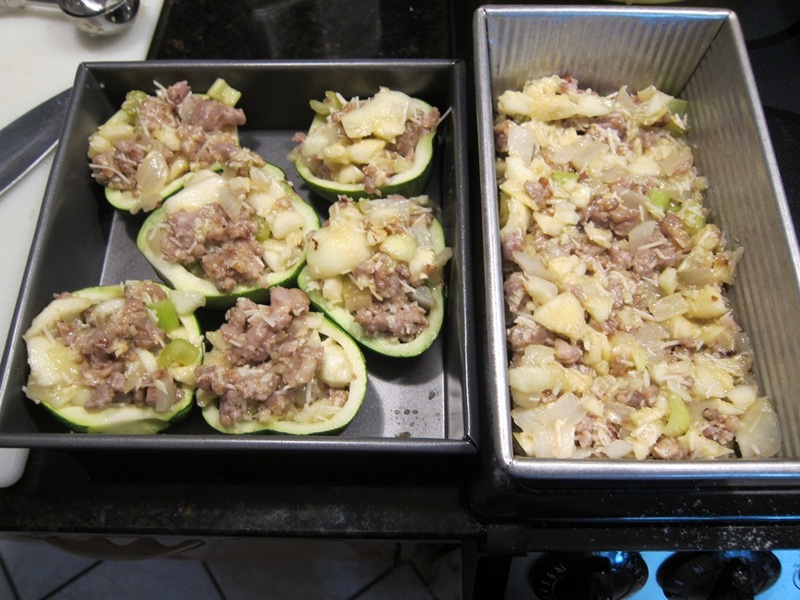 Fill the shells with a heaping amount of the sausage mixture. Place any remaining mixture in a small greased pan, like a bread pan. Sprinkle additional cheese on top of the zucchinis, as desired. Bake 20 minutes, or until lightly browned on top, and serve. 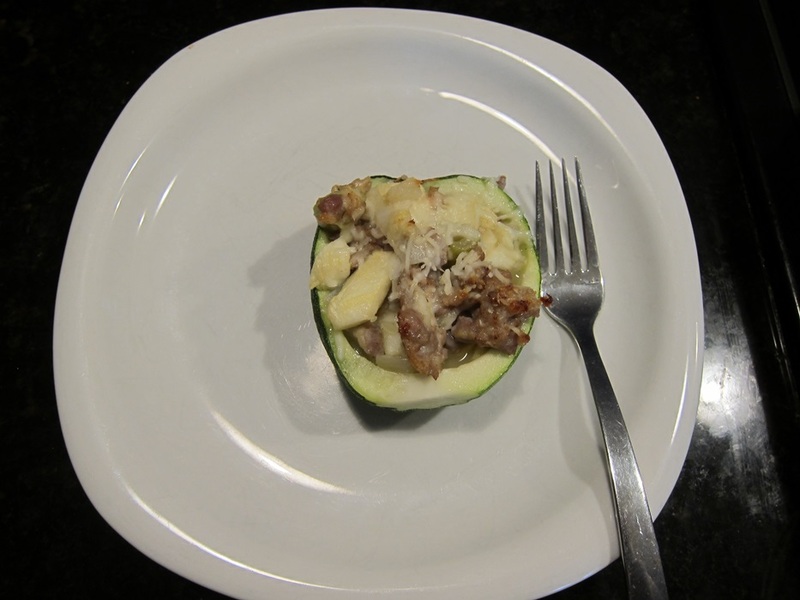 This entry was posted in Dinner and tagged gluten free, stuffed zucchini, zucchini. Bookmark the permalink. Hey! I made something very much like this last night for dinner, but I was both lazier and less lazy. 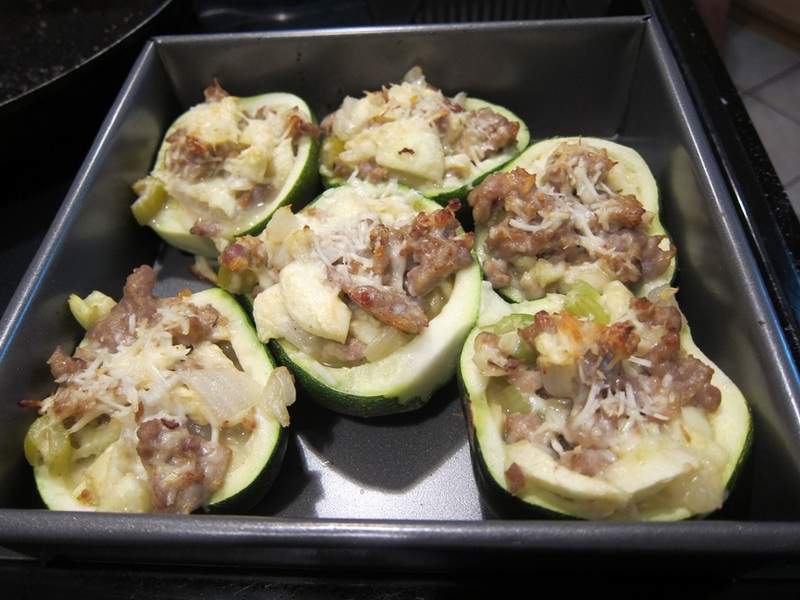 I did not pre-cook anything, but I used ground pork and made my own sausage to stuff the zucchinis with. I liked it — and zucchini isn’t my favorite, generally, but letting sausage cook into it makes it really good. Great minds think roughly alike?! Zucchini’s one of the vegetables I’m more likely to get, kinda boring, but doesn’t clash too horribly with much.